The Anderida Gorsedd open rituals began on the Spring Equinox 2000, the dream of Druids Damh the Bard and Cerri Lee to revive the regular celebrations of the old Pagan festivals in the sacred landscape of Sussex. 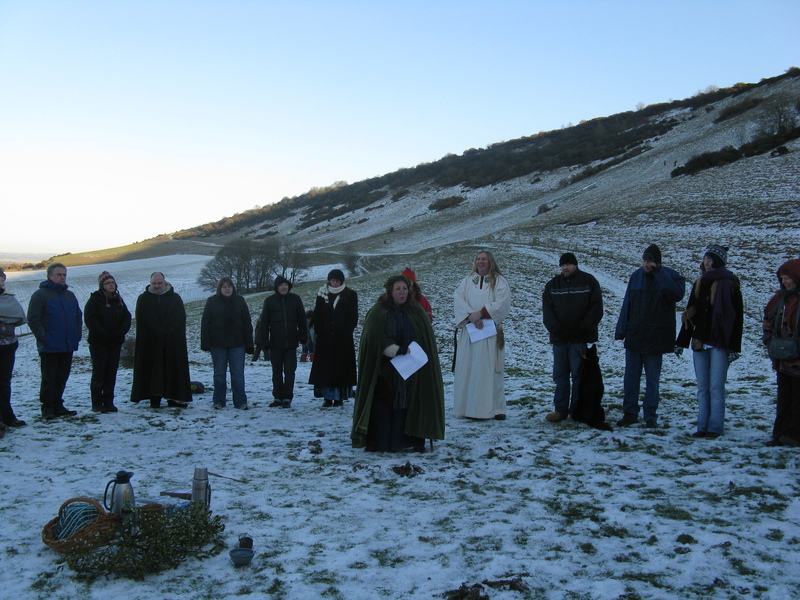 On that cold day 7 people braved the weather for a walk up the hill to the Long Man, and there the Gorsedd was proclaimed. By Beltane six weeks later word had spread throughout the Pagan community and 40 people joined together to celebrate the Rites of Spring. Since then the Gorsedd open rituals have been held for every fire festival, equinox and solstice, rain, snow or shine, and it is this reliability and consistency that have been the root of its success. Now anywhere between 60 and 100 people gather under the Long Man to honour the turning tides of the Wheel of the Year, sharing laughter, tears, song and story, as the Gorsedd enters it fourteenth year! If you would like to find out the date of the next festival, you can either email using the contact form on this site, or for updates on all of the Anderida Gorsedd events join the Facebook group.